Check out our newest Pick and Play experiences! 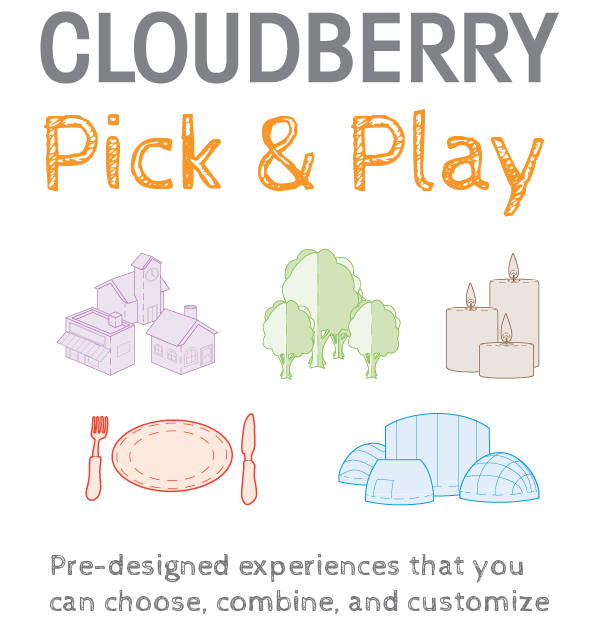 Cloudberry Pick and Play is celebrating its first birthday, and in honor of that, we’ve developed even more pre-designed experiences that offer the same fresh ideas and boutique design experience for which Cloudberry is known. These toddler-focused Pods immerse children in a multi-sensory world full of structured and unstructured activities that encourage them to explore creatively, academically, and developmentally. With TodPods, you can create an experience that not only engages the youngest learners in the moment, but also gives them, and their caregivers, the tools to explore the world in new ways when they leave. More than just an amazing immersive play experience, Our Town gets children thinking about and enacting what it means to be a community. And each time they visit, the community of children will be different, creating a brand new town for them to explore. With over 40 designed areas available, you can easily make Our Town your own. All experiences start in the Home, celebrating family as the core community in a child’s life. From there, children can explore activities in the Park, School, Main Street, and Town Hall. When children step into Cloudberry’s Our Forest they are immersed in an exploratory environment that challenges their minds and delights their senses. They can discover nature on their own, or put on some Critter Clothes and role-play their way through the experience from an animal’s point of view. Our Forest can be seasonal. Separate areas for Spring, Summer, Fall, and Winter highlight how each season affects plants and animals. It can also be regionally-specific. We have designs for Temperate, Boreal, Desert, Tropical, Mangrove, and Redwood biomes. Our Food invites children to explore the rich stories of food through self-directed and collaborative play in real-world environments. From market to kitchen, and farm to factory, children are challenged and surprised by where the food they eat comes from and how it influences their physical, social, and cultural lives. Children can explore on their own—shopping in the Market, making a recipe in the Kitchen, grabbing some international Street Food, or following the path of a helpful insect in the Garden. They can also learn and play collaboratively as they create a community meal in the Backyard Celebration area, run a Restaurant, or produce, stamp and load food for delivery in the Factory. Our Holy Lands welcome children to a world that they already know well, even if they have never traveled there before. Children can retell and re-enact their favorite religious stories, and create new ones, as they journey through the Desert, climb the Mountain, shop in the Market and explore the Ruins. Though they are designed for children, each Holy Lands experience will be personal, relevant, engaging, and inspiring for anyone who has wondered what a visit to their holy land would be like. When children dive into Cloudberry’s Our Oceans, they are immersed in underwater wonderland. They can discover on their own, collaborate with other children, and role-play their way through the experience from a marine animal’s point of view. Our Oceans has designs that explore Tropical Seas, The Open Ocean, The Deep Sea, Icy Seas, Mangroves, and The Coast. These modules can be used separately to focus on particular regions of the world, or combined for a comprehensive experience of our amazing marine habitats. All of the designs are fully scalable and customizable. With a range of designs, you can easily select options that create engaging experiences in 500 or 50,000 square feet. Contact us today for more information on how to create your own Pick and Play experience.